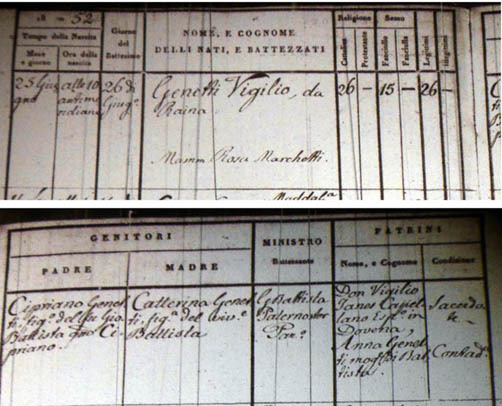 Vigilio Genetti, born 1852 in Castelfondo, Austria. Died 1932 in Collinsville, IL. The Illinois Genetti Clan has proven to be very inquisitive and helpful concerning our shared ancestors. A few weeks ago I received an email from Brian Genetti with info about his family line. It turns out Brian is also a descendant of Vigilio Genetti who settled in Collinsville, Illinois around 1890. Why I say “also” is that I have had three other descendants of Vigilio contact me during the past year (Tom, Gary and Andrew). Each has contributed a bit more of our ancestral puzzle and allowed me to research further into their branch of the family tree. As a result of Brian’s info, I was able to add ten more descendants to our online tree and continue to extend Vigilio’s legacy in America. Brian says he also has photos of Vigilio Genetti tucked away somewhere. When he finds them we’ll add those pics to our photo archive page too. – Brian is 1st cousin, twice removed from Tom. – Brian is 1st cousin, once removed from Gary. – Brian is a 3rd cousin of Andrew. And Brian is my 5th cousin, once removed AND my 8th cousin once removed! Yes, my family twig is related to Brian twice! Do you have descendants you would like included on our family tree? I believe we have only about a third of our ancestors documented so far. Feel free to email me with your information. If I can find documentation on the ancestor, I will add he/she to the Genetti Family online tree. Many thanks to the Illinois Genetti Family for their participation.